Russia: World Cup Strays – Impounded In Shelters or Murdered ? – Your Views Please. 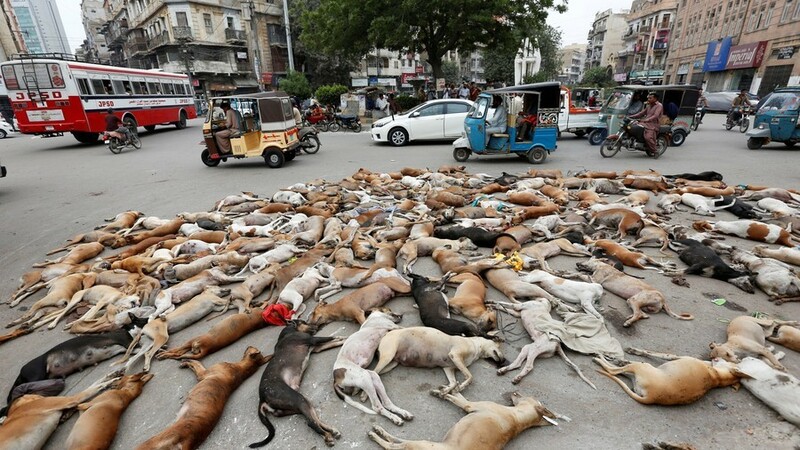 Regarding our recent post about stray dogs being killed in Russia for the lead up to the World Cup; there are reports that some of the photos used have actually been dogs killed in places such as Pakistan. Killing stray animals is a lucrative business in Russia. Companies compete for municipal contracts that pay a set fee per animal killed. According to reports, Yekaterinburg paid a municipal waste management company over $533,000 in December 2017 to capture more than 4,500 dogs. The Moscow Times reported that the dogs were held up to two weeks before being euthanized. ‘deputy prime minister Vitaly Mutko ordered all 11 cities hosting World Cup matches to set up temporary shelters for stray animals. Municipal shelters were built in St. Petersburg, Nizhny Novgorod, Kaliningrad, and Saransk, with foster centres being built in the rest of the cities. Some of these shelters can expect an influx of stray animals ahead of the tournament, many of whom will spend the remainder of their lives in overcrowded cages’. So; temporary ‘shelters’ for stray dogs, or a policy of simply killing all that they round up and catch. Who is to be believed with what they say ? How do you feel about these stories ? – please give feedback via the ‘leave a reply’ box at the end of the original article; or on this one. SAV. Too many humans kill. Support and love those who do not.